The company is repurchasing $750 million of its debt this week, which will dramatically strengthen its balance sheet. In early 2017, Macy's (NYSE:M) vowed to clean up its balance sheet. At the time, it was in the midst of a multiyear sales and earnings slump, and management recognized that the company needed to be better prepared for future downturns. Macy's has continued paying its regular dividend, which amounts to $1.51 per share annually, but otherwise it has devoted all of its free cash flow to debt reduction since then. 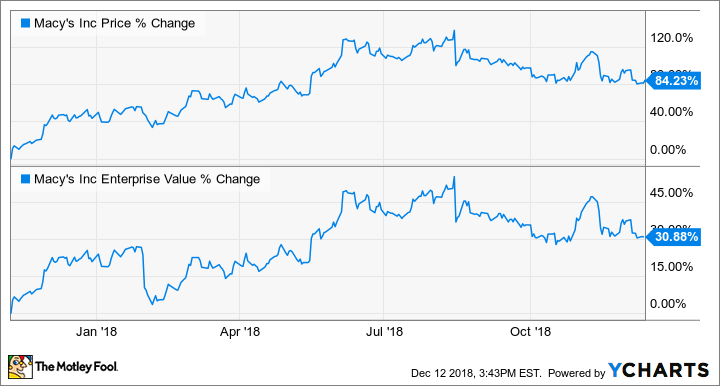 Given that Macy's generates most of its cash flow in the fourth quarter, the company tends to make its boldest debt reduction moves near the end of the year. Sure enough, Macy's announced on Wednesday that it will repurchase more of its debt than previously expected in conjunction with a tender offer it launched two weeks ago. On Nov. 28, Macy's began a tender offer with the goal of repurchasing $600 million of its debt. This would have been even bigger than the $400 million tender offer Macy's executed around the same time a year ago. Macy's is shrinking its debt load once again. Image source: Macy's. The "early tender" deadline was this Tuesday. Debt that was tendered before this deadline is eligible for an extra payment and is first in line to be repurchased. Macy's saw a strong response to its offer, with more than $1.5 billion of debt (at face value) tendered as of Tuesday afternoon. As a result, Macy's has increased the size of its tender offer. It now plans to repurchase $750 million of its debt in transactions that will settle on Thursday. This will reduce its debt to less than $4.8 billion, down from a high of more than $7.6 billion in early 2016. By repurchasing $750 million of its debt, Macy's will reduce annual interest expense by nearly $50 million going forward. That will add $0.12 to its earnings per share on an after-tax basis. Even more importantly, the upsized tender offer means that Macy's should easily exceed the debt reduction target it set out in early 2017. Macy's official leverage target calls for adjusted debt to be between 2.5 times and 2.8 times adjusted EBITDA. As of the end of last quarter, debt had declined to 2.6 times adjusted EBITDA from 3.2 times adjusted EBITDA a year earlier. The $750 million debt repurchase should bring that leverage ratio down at least as far as 2.4 times EBITDA -- and possibly even more, depending on Macy's earnings results. Shares of Macy's have nearly doubled since bottoming out last November. That said, the stock looks even more like a bargain today than it did back then. First, investors should give Macy's proper credit for cleaning up its balance sheet. Indeed, Macy's enterprise value -- which factors in net debt as well as a company's market cap -- is up just 31% from its November 2017 low. Macy's Change in Stock Price and Enterprise Value, data by YCharts. The increase in its enterprise value would be even smaller, factoring in this week's tender offer results. Macy's market cap has risen by $4.6 billion, but a substantial piece of this gain has been driven by what will likely be a $2 billion-plus reduction in the company's net debt between last November and the end of fiscal 2018. Second, when Macy's shares touched their multiyear low last year, the department store giant had been posting steady declines in its sales and earnings for more than two years. By contrast, the company has now logged four consecutive quarters of comp sales growth, and its profitability has stabilized. The decision to repurchase more debt than originally planned may even indicate that business is booming this quarter. Macy's stock currently trades for just nine times forward earnings, despite the company's much-improved balance sheet, solid sales trends, and stable profitability. That makes it one of the biggest bargains on the stock market today.